With 400 miles of coastline, Rhode Island is a fly fisher’s paradise. The state offers plenty of salt ponds with worm hatch that bring fish right to the surface. You’ll find plentiful striped bass and bluefish around Narragansett Bay and reefs around Newport. 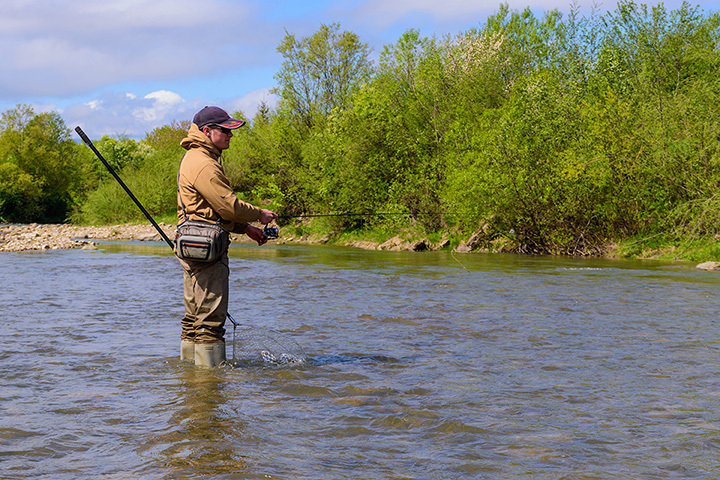 From summer to fall, you’ll be swept away in acres of fantastic fly fishing territory. Early on in the season, Northern Pike inundate this pond. Later on, largemouth bas and bluegills will come through. If you’re a beginner flycaster, this is the place to train! This coastal salty lagoon offers amazing flat areas that gather plenty of stripers in low-light conditions. When the aquatic worms come to the surface, the bass will flock, making your job so much easier. Along the craggy rocks of the Narragansett Bay shoreline, you’ll find plenty of places to ambush Stripers that come out there to feed. The fish feed at the surface, too, making them within a catching distance of a skilled fly fisher. With Block Island not too far from these reefs, you’ll be sure to find plenty of fish along Watch Hill! The deep, cool water here is a great place to secure a trophy catch. You’ll want to get in the action of the worm hatch striper frenzy at Ninigret Pond, Rhode Island’s largest coastal salt pond. It’s not dry fly fishing for stripers, but it’s the closest you’ll get! View more Rhode Island Fishing Holes.